If you prefer reading on a Kindle to your iPhone or iPad, today’s Instapaper for iOS app update should suit quite nicely. Provided you have an active Instapaper subscription, you can now send your saved article to a Kindle device from inside the iOS app. Betaworks asks that you register your Kindle email address first with Instapaper, but otherwise it’s smooth sailing. Version 5.1.5 of the iOS app also introduces Instapaper Daily, which we first spotted on the Web in December last year. 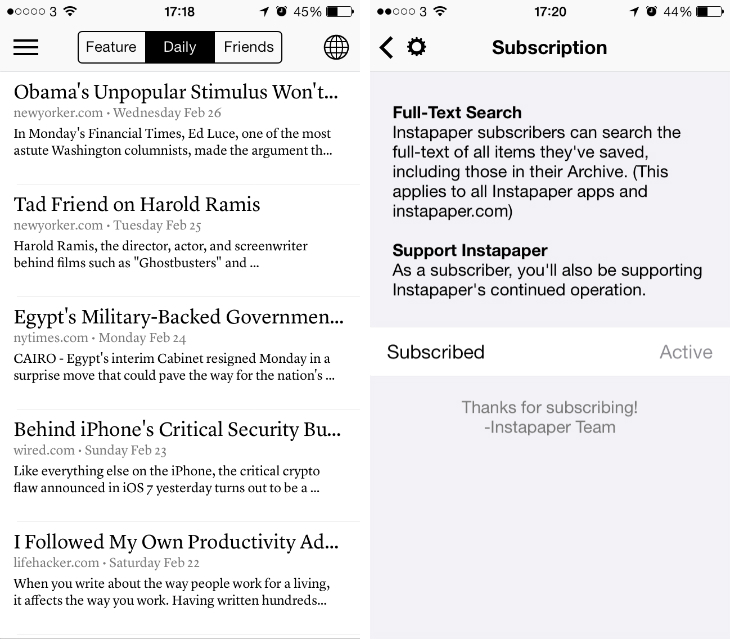 The service highlights the most widely read stories on Instapaper and you can now access it from inside the Browse section of the iPhone and iPad app. It’s not as powerful as Pocket’s discovery features, but it’s still an effective way to track important stories. Instapaper for iOS now supports AirPlay streaming too and features new gestures so you can quickly jump back to your saved items after finishing a paginated article. Finally, Betaworks has implemented renewable subscriptions so that premium users no longer have to submit new payments manually. Bliss.